Sky Italia is broadcasting all 17 days of the 2012 London Games beginning on July 27th in high-definition, souped up for the first time with deltatre’s graphics services. 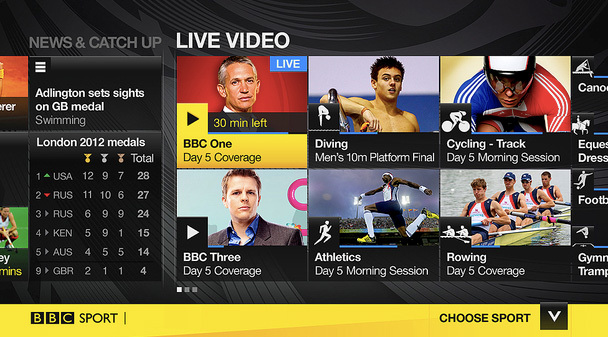 Sky is digitizing 2,000 hours of real-time, Live Olympics on 13 channels (12 in HD and 1 in 3D). This techie extravaganza between Sky and deltatre will undoubtedly break all viewing numbers for a broadcast coverage of the Summer Olympic Games because of their nearly five million Italian customers who will break another record with the amount of connected smartphones, tablets, computer’s and televisions. Olympics coverage began with photos and radio then morphed into TV images which today are digital, wireless and in the clouds. Never before in the history of the Olympics or sports technology, will a concentration of data, live video, media and social network content be produced via England on such a massive level. From 8 am to 8 pm, the London Games will be operational with viewing options provided by Sky, all 24 hours of each day. By implementing the deltatre turnkey Solution, Sky is delivering a comprehensive technological package worthy of these most techie of Games. Vincenzo Flores, Head of Olympic and Paralympic Games Production at Sky Italia, said “We have appointed deltatre because of its strong know-how in broadcast solutions and the Olympic Games. We worked closely with them providing TV graphics services for the Vancouver Olympic Games as well as the Italian Serie A and they helped us to deliver a great TV experience to our sports fans”. deltatre DIVA – data integrated video application, the world’s greatest player: http://youtu.be/3FHwJHq1Qgc. Having the option to stop the video play of any Olympic sport, whether live or recorded, and then selecting different angles or criteria while socially connected to other people, is fantastic. Learn more about deltatre sports media services, DIVA and the London Games, by reading this previous Sports Techie blog: https://sportstechie.net/london-2012-digital-games-powered-by-deltatre/. What rocks further for Italian fans is getting to use the My Sky HD. It’s a decoder with a built-in hard drive. Using the Sky On Demand service, or recording your own video of your favorite athletes, sports and Olympic programs, are must use features. Sky Go service subscribers have additional tech options for watching their channels on tablets, PCs, Mac computers or iPhones. Please visit the website: www.sky.it. “Always striving for the next level of interaction,” is a deltatre motto. They “consider the future of global sport engagement to be multi-platform and social.” The Vancouver Games experience is a feather in their cap yet it’s sure to increase expectations in London for deltatre. Because of their work with the Italian Serie A, software localization issues with the Italian language should be no problem. The dynamic tech Platform created between Sky and deltatre technology is certain to be on par with similar broadcasts going on around the world. Ciaran Quinn, deltatre Director of Olympics and Strategic Business shared the following, “At deltatre we work to support the world’s leading broadcasters in their efforts to deliver a terrific Olympic Games experience to fans. We add our knowledge of broadcaster operations the live sports environment, and real-time results for the Olympic Games to our cutting edge software to enable Sky Italia to produce innovative and dynamic TV graphics. This is the first Summer Olympic Games that Sky Italia will broadcast with such extensive coverage, and we are really pleased to work with them as they offer a terrific viewing experience of the world’s greatest multi-sport event”. Television graphics are nearly standardized content included into most all modern sports and Olympic broadcasts. The importance of social networks makes it another must have option for TV event production companies. All this Big Data is delivered via the video medium. deltatre CTO, Carlo De Marchis – http://twitter.com/carlodemarchis, wrote, “Video is the crucial asset for truly engaging digital sport experiences. One key factor in making this happen is having live video immediately available as on demand so fans can quickly go back in time or rewind what they just have seen. Rich interactive video experienced will be increasingly based on the concept of having the data and events timeline fully synchronized. This will allow us to have two critical features. Sky Italia is the Italian pay TV platform wholly owned by News Corporation. Born in 2003, it rapidly grew reaching 4 million 940 thousands subscribers in March 2012. Sky currently offers more than 190 thematic and pay per view channels, with a rich offering of movies, sports, news, entertainment and kids programming. Sky was the first Italian television to broadcast in HD and live in 3D, and offers a pack of 52 HD channels and one channel entirely dedicated to 3D programs. Moreover, My Sky HD, the decoder with a built-in hard drive, makes it possible to easily record one’s favorite programs and to use the Sky On Demand service, whereas with the Sky Go service subscribers can watch a selection of Sky’s channels on tablets, PCs, Mac computers and iPhones. There is a way to make sport events come to life for audiences everywhere. Using innovative technology, creativity and total commitment, the people at deltatre do exactly that. With staff in Torino, London, Manchester, Lausanne, Paris, New York and Portland, deltatre has over 25 years’ experience at the highest level of international sport. Always striving for the next level of interaction, we consider the future of global sport engagement to be multi-platform and social. Today, the greatest sport events on earth are more immersive, collaborative, and inclusive thanks to our cutting edge technologies. Sport fans become an active part of the event, connecting socially and sharing their passion, wherever they are. By harnessing our experience, technical skills and passion for sport, we are always one step ahead. This sportsbiz partnership with deltatre ideally comes at a good time for Sky when considering the overall state of the Italian economy. It is logical that viewers will be engaged for longer periods of time, thus creating more business opportunities for Sponsors. Other rights-holding broadcasters around the world are monetizing with a definable return on investment for technological expenditures by making that plunge with deltatre, which is the path Sky is now on. Sports Techie in Italy are plugged in and able to enjoy the new integration of deltatre together with Sky for robust, interactive, and breath taking video experiences, while in the comfort of home, office, car, restaurant, at a kid’s game, doing fitness, or whatever their users may be doing, because of sports technology. Enjoy the unprecedented amount of sports tech at the 2012 London Olympic Games everyone.